Part four in this series about building a color mechanical television covers how to implement color systems. The next phase of this mechanical television project is implementing the color systems. Whenever Windows or Linux is running on the computer to be used for playing the WAV files, the player application (Audacity, or the provided "playloop-48k" program, or any other) cannot directly send its stream to the sound card. The stream instead flows through an audio mixer so that several applications can produce sound at the same time even if their output audio streams are at different sample rates. This is why the mixer resamples every source at a targeted output sample rate for being able to mix. *It must not be 44.1Kspl/s or any multiple of this frequency. Otherwise, the resampling process will totally flaw the color carrier modulation. The choice of 48Kspl/s as the source file and mixer sample rates has been made because PC audio hardware often runs by default at this frequency or at least supports it natively in any case. Soundcards usually re-sample any stream which is sent to them if this stream is sampled at a multiple of 44.1Kspl/s (and we absolutely don't want that). In the contextual menu of the speaker icon located in the task bar, select the playback devices. Then, edit the properties of the output you plan to use and select the "advanced" tab. 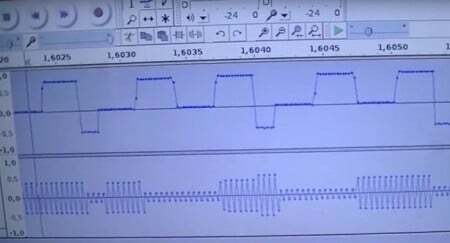 The sample rate should be 48000 Hz (16-bit) by default. Otherwise, set it to this value. This test can be led without any additional hardware, except the cable that you will use anyway to connect to the NBTV television system. Even a cheap and/or very old analog oscilloscope can fit for this test. For a sound card output rate at 48000Hz: Raw square wave, varying between only a few discrete amplitude levels (because of the simple color bar modulation used). If your sound card management utility and/or mixer includes an audio equalization feature, don't forget to disable it! The reasons exposed here above, it is obvious that using an audio CD player (sampling at 44,1KHz and filtering at 22KHz) cannot lead to successful results with the presented color system. The hardware expects positive video. This means that synchronization pulses step down at the lowest voltage level (under the video black level) while visible signal varies above the black level. Remark: To help keeping a rock stable synchronization extraction, even in the case of fast brightness changes (very important for a mechanical TV), it has been preferred to apply a black level at 50%, leaving the remaining 50% for the visible signal, while classical video standards define 30% and 70%.